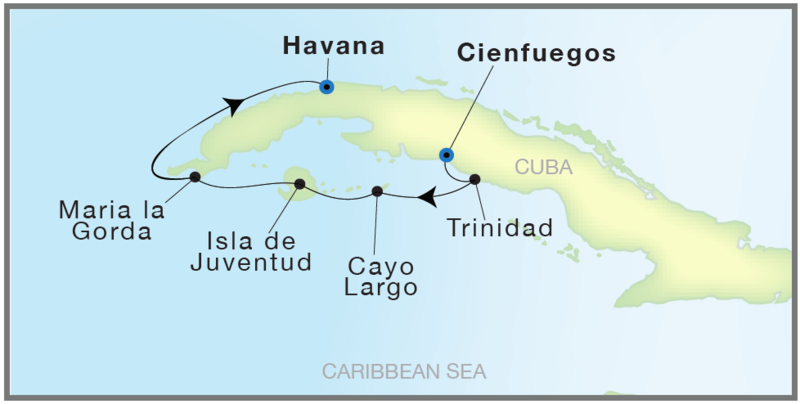 CUBA 2019 - ROGER KERSHAW CUSTOM TRAVEL INC.
Delivering a truly unique itinerary exploring the exotic destination by mega-yacht, we will depart directly from Cienfuegos and circumnavigate the western side of the island to Havana for an overnight in the capital city. The 112-guest mega-yacht, SeaDream II, will provide the ideal vantage point to experience the Caribbean nation’s rich, cultural landscape. The expression “yachting” is not only a statement about size; it describes a lifestyle aboard the intimate vessels. Chic and stylish, SeaDream’s 56-stateroom twin yachts are favored for their elegant informality, personal award-winning service provided by a crew of 95, inclusive open bar and gratuities, ocean view accommodations, luxury Thai-Certified spa and world-class cuisine. 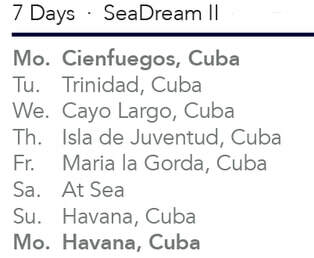 With only 112 guests at a time, a SeaDream voyage feels like a personal getaway with that special someone, a group of friends and family or for that solo traveler looking for much needed “me-time”. Be pampered & relaxed, or active & adventurous while traveling to some of the most intimate ports and destinations. Discover the “It’s Yachting, Not Cruising” secret that travel experts, loyal past guests and other cruise enthusiasts are raving about. It’s uniquely exceptional and a must do for those in search of a hidden, refined style of cruising. Enjoy an inclusive experience with premium select spirits, 5-star dining, gratuities and more on SeaDream and enjoy all that yachting has to offer, onboard and shoreside. off Brochure Price. Prices here. Important Information for US Citizens, and others.